I wake at 7.00am and Tam has already sneaked out of the hut. I dress quietly and leave the girls asleep then go and look for Tam. She is just reaching the front of the long queue for coffee. We find a seat and enjoy our coffee and a Danish. 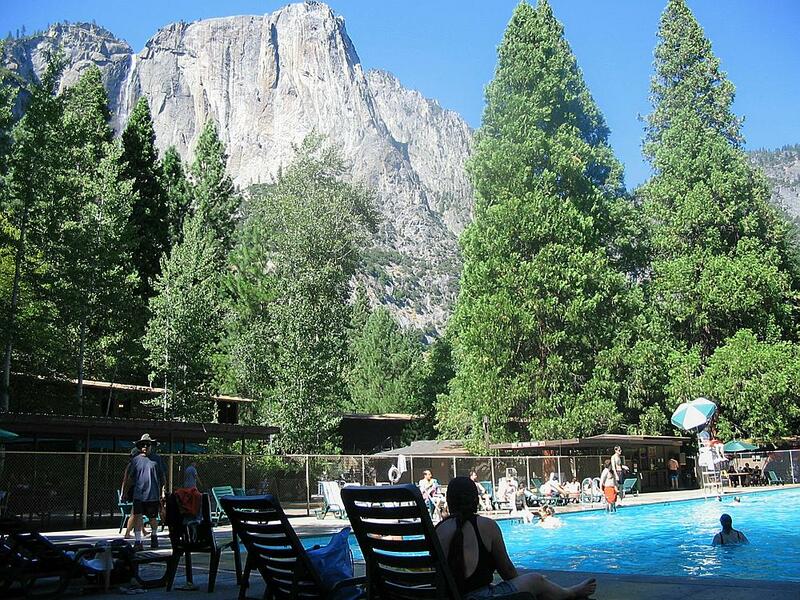 We are leaving Curry Camp today to move just up the road to the Yosemite Lodge for one night. Overall my thoughts on Curry Camp are very positive. The location is perfect and beautiful. The lack of TV, radio or telephone are a very good thing, you are cut off from the rest of the world for a few days. I didnt even mind that everything shuts down at 10.00pm as this creates an early to bed early to rise philosophy. It is amazing how many people are up and around between 6.00am and 7.00am every morning. When you consider the number of people staying here (it must be around 1,500) its surprisingly quiet at night. The only bad things I can think of are the queues for everything. If youre going to accommodate large numbers of people you really should provide adequate services. As we load up the car to leave there is a woodpecker just a few feet from us. He totally ignores our presence as he busies himself with his activities. At 9.00am we leave Curry Camp and drive along the Tioga Pass to Tuolumne Meadows. I had read that this road is very winding with some places with steep drop offs. I didnt really find it that bad, in fact the road into Kings canyon is far scarier from that point of view. 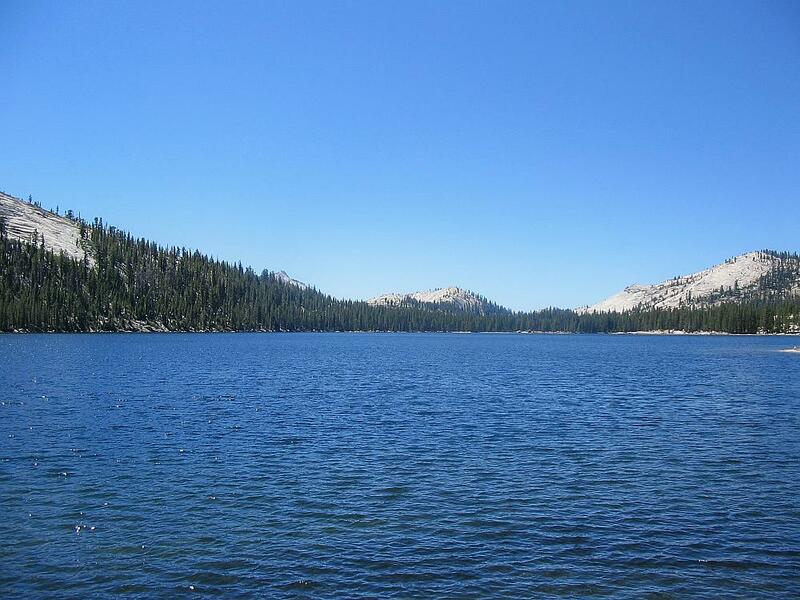 It takes about 1 ½ hours to reach Tuolumne, which is an alpine meadow way up in the mountains. Its very pretty, but I think you would have to take one of the many hiking trails to truly see the best of this place. It is supposed to be very beautiful in the spring when all the wild flowers are in bloom. After our exertions yesterday walking any distance is not really an option. In fact, Tam is moving at the pace of an 80 year old. After taking a few photos we get some rolls from the local store and re-trace our steps as far as Tenaya Lake where we stop for lunch. The difference in temperature is quite noticeable. The forecast for the valley floor today is 94°F, up here its 75°F. Still beautiful blue skies though. Tenaya Lake is set among the pine clad mountains and is a very pretty place with just a few people enjoying a picnic or swimming in the lake. Back in the car we return to the valley to book into the Yosemite Lodge for 1 night. Our room is not ready at 2.30pm (check-in time is officially 5.00pm, which seems a bit late) so we get a pass to use the pool. Tam asks about laundry facilities only to be told that there are none. This is really surprising. There wasnt a laundry at Curry Camp either. I suppose Im so used to staying in nice hotels with every facility for the guest that this comes as a bit of a shock. Still, sitting by the pool is a pleasure in itself. The pool at Curry camp had lovely views, but this is even better. We are less than a quarter of a mile from Yosemite Falls. It takes some beating to be writing up your trip report while occasionally glancing up at the 5th tallest waterfall in the world. Its so high that the water almost seems to fall in slow motion and takes forever to reach the bottom. You can just see the Falls in the top left hand corner of the picture. At 4.00pm we get the key to the room, which is in one of the outlying buildings. Our room is on the ground floor and is a good size. Its nicely decorated, but is showing its age a little. The best thing is the partial view of Yosemite Falls we get from our patio at the back. Although I enjoyed Curry camp, it is nice to get a bit more room so we can bring in all the suitcases and sort them out. A bathroom with shower is also much appreciated. Mind you, at $180 per night it should be good. Even Curry camp was over $100 per night and both places sell out well in advance in the summer months. A TV and telephone completes the feeling that we are back in the civilised world. Im not sure if this is a good thing or not. We all shower and then pass through the shop on the way to the bar. An exceptionally loud shirt with views of Yosemite cries out to me. I have to have it to compete with Shaun and Matt. At the bar the service is slow and we have to rush to get to our 8.00pm reservation at the Mountain Room restaurant. As we are seated we agree that this is a very nice place. All the tables have a view of Upper Yosemite Falls through the huge glass wall at the end of the restaurant. By the way, the information book in our room says that the whole resort is due to be re-built to modernise it. Prior to the big flood of 1997 there were 495 rooms, there are now 245 rooms, modernisation will mean 251 rooms. We have been seeing signs all over the valley floor showing the height of the floodwaters. It must have decimated most of the lodging and housing. The signs show the floodwaters about 6 feet above road level. Back at the restaurant  we all enjoy the food very much. Georgia has chicken breast, Tam has lamb chops with couscous, India has onion soup and prawn satay while I have Pacific Yellowfin Ahi, which is lightly seared tuna with wasabi-mashed potatoes. We also have a bottle of Robert Mondavi Private Selection Merlot, which is very nice indeed. Our waiter, Scotty, is very nice, but does seem a little overworked. He has too many tables to deal with. This is indicative of the service we have found all over the valley. Not enough people spread too thin. If they are going to continue to deal with this many people they have to get their act together. Maybe its just coming towards the end of a hectic summer season. Anyway, the food is really very good and it is an excellent way to close our visit to Yosemite. The total including tip is $140. I forgot to say that this included white chocolate crème brulee (which was wonderful) for dessert as well as a coffee for Tam and another glass of wine for me. Walking back to the room we look up at the skies. We have been looking at the night sky every night during our stay at Yosemite. I presume it is the lack of artificial light around the place, but I have never seen so many stars. There are thousands upon thousands of them. I have seen beautiful night skies both in Florida and on a cruise ship before, but nothing like this. I would really love to be up at Glacier Point in total darkness looking up at the skies, it must be spectacular. Back to bed at 11.00pm.